Canon has a fantastic lineup of entry-level DSLR cameras in their Rebel line. Canon is no slouch when it comes to mid-level cameras, either. With five different models falling within Canon’s “intermediate” category, there is plenty to choose from at nearly any price point. This guide will cover the current mid-range models of Canon EOS DSLRs. Two things to note first: the Rebel T6s is considered intermediate, but we reviewed it in our Canon Rebel guide. And second, the Canon 70D has been replaced by the 80D, but is still available through many sellers at a great price. Without further ado, here is Canon’s current lineup of mid-range/intermediate DSLRs. The 77D is the lowest price mid-level (excepting the Rebel T6s), and it’s the most recently released. Its features put it somewhere between a Rebel T7i and the 80D. It’s a solid model, but nothing overly exciting. We like the AF system and the touchscreen, and the image quality is fantastic. However, it lacks the ability to capture video in 4K, which is very disappointing given both DSLR trends and the 77D’s status as a mid-range DSLR. The 77D does feature Wi-Fi connectivity, which is a plus. The overall functionality of the touchscreen LCD is outstanding, and the top plate LCD is handy. In short, the EOS 77D is a good – though not great – camera. If you’re looking for a bit more oomph, we recommend saving your dollars for an 80D. The next step up from the 77D is the fantastic EOS 80D. It is under $1000 for the body, and it has a ton of excellent features. 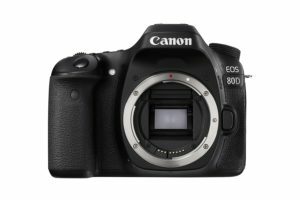 We chose the 80D as one of the best DSLRs for video in our review of the best DSLR cameras. Based on the specs and the price, you might think that this model was designed to appeal to a broad range of photographers. We would agree. The 80D works fantastic for a variety of shot types, and the sensor, AF, and design work well for everything from nature shots to weddings. It’s really a great buy, especially for an enthusiast upgrading their entry-level DSLR. While it doesn’t have 4K video options, the 1080/60p capture is excellent. 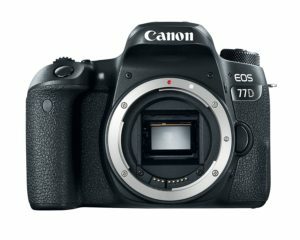 Regarding changes from the 70D, which it replaced, it absolutely matches and elevates performance and has additional features that make it a worthy successor. The body is comfortable and well-designed. Overall, we think this is one of the best mid-range DSLRs on the market. The EOS 6D is the first of two full frame DSLRs in the mid-range category. It is essentially a “budget” full frame; for a nice price you can pick up a full frame DSLR that features Wi-Fi and GPS. One of the best parts of the 6D is its ability to focus in low light levels. It also has in-camera HDR and is ergonomically appealing. We’re fans of the LCD screen on the 6D. And the important stuff: the image quality is excellent. There are two drawbacks to the 6D however. The first is that it only has one memory card slot. The second is that it lacks a built-in flash. 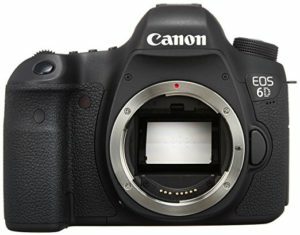 If you can handle those missing features, this affordable full frame EOS 6D will impress the heck out of you. 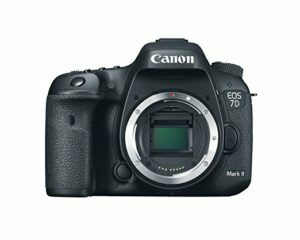 The second full frame mid-level option, and Canon’s highest price point for intermediates, the 7D Mark II is an excellent choice for enthusiasts. It has made it to the top of many “Best” lists, and it remains a popular option for a mid-range DSLR. The 7D Mark II captures gorgeous images and offers high ISO performance. It also features enhanced environmental sealing, making it an excellent camera to take out into the elements. The built in GPS is a nice addition, but the 7D Mark II lacks built in Wi-Fi (it’s only available with an adaptor). The fixed LCD is one drawback in addition to the missing Wi-Fi. However, we still think it’s a great option for a move to full frame – and, while still priced high for a mid-range, it’s still a decent price for the specs and full frame sensor. The design is intuitive and comfortable, and it’s a well-loved DSLR by pros and new enthusiasts alike.